Glass bottle with cork stopper of Dr. J. Collis Brown's Chlorodyne Drops (Opium tincture, chloroform and cannabis) with original paper labelling. 102 mm x 26 mm diameter, 44 g. Dispensed by J.T. Damuford, English, 2nd half of 19th century. Square glass bottle of Chloroform and Morphine tincture in a leather covering. 120 mm x 40 mm x 35 mm, 176g. Faded inscription reads, 'TR. CHLORO (illegible) MORPH Co.' Burroughs Wellcome, London, 1900-1919. Clear glass shop round containing Chlorodyne lozenges (Tincture of Morphine and Chloroform). 186 mm x 74 mm diameter, 384 g. Unknown maker, English, late 19th century. 2 empty tin canisters, oblong, square in section, small neck in corner of top with screw thread cap for chloroform and morphine tincture (trace remaining). 157 mm x 58 mm x 58 mm, 138 g each. Painted inscription reads, ' Tr. Chlorof et Morph B.P. 1885'. English, 1885, used during the First World War. Glass bottle of 'Indigestion Mixture' with bakelite lid, containing sodium bicarbonate, rhubarb, chloroform and morphine. 171 mm x 66 mm x 34 mm, 236 g. Printed label reads, '.../INDIGESTION/MIXTURE/An invaluable preparation for disorders of the/ Stomach and Digestion.../SAVORY & MOORE LTD./Chemists to the King/LONDON. W.1' Manufactured by Savory and Moore Ltd., English, 1910-1936. Amber glass bottle with glass stopper half-full of Aromatic Bismuth and Pepsine liquid (MIST. BISMUTH AROM. c. PEPSINO). 224 mm x 77 mm diameter, 725 g. Used as an anti-dyspeptic, ingredients include bismith, pepsine, chloroform, morphine, and nux vomica (strychnine). Gale, Baiss and Co., London, 1930-1970. Rectangular glass bottle with glass stopper for Chlorodyne, with traces remaining. 109 mm x 34 mm x 24 mm, 89 g. Handwritten label reads, 'POISON/Shake the Bottle./Chlorodyne/Dose 5 to 20 minims'. W and T Avery Ltd., England, 1870-1910. Amber glass bottle with cork stopper approximately one-third full of 'Linctus Tussi Rubrum' cough linctus ( chlorodyne and hydrobromidic acid). 140 mm x 49 mm diameter, 212 g. Made by Corby, Stacey and Co. Ltd., English, 1890-1930. Rectangular glass bottle with ground glass stopper one-quarter full of 'Chlorodyne' (morphine and chloroform tincture, with cannabis in some recipes). 106 mm x 27 mm x 34 mm, 93 g. Dispensed by W.R. Baker, Sidcup, English, 1850-1880. Square glass bottle with glass stopper for Chlorodyne (morphine and chloroform), with trace contents remaining. 73 mm x 35 mm x 30 mm, 82g. Unknown maker, English, c1850. Square glass bottle with chamois covering on stopper of Chloroform Liniment with Laudanum(opium tincture), bottle full. 132 mm x 44 mm x 44 mm, 272 g. Yellow chemists label reads, 'FOR EXTERNAL APPLICATION/THE LINIMENT/From Savory & Moore/...... /of Chloroform/ with Laudanum./....' Savory & Moore, English, 1870-1901. Glass jar with ground glass stopper of Chlorodyne Lozenges, each lozenge with moulded 'chlorodyne' label. 120 mm x 55 mm x 40 mm, 267g. Produced by the Civil Service Co-operative Society and dispensed by M.H. Arundel, London, c. 1850. Narrow glass bottle with ground glass stopper containing an unidentitied brown liquid, half-full. 96 mm x 35 mm x 21 mm, 87 g. Most likely Chlorodyne based on partially obscured label. Unknown maker, English, 19th century. Rectangular glass bottle with glass stopper approximately half-full of Chlorodyne (morphine and chloroform). 105 mm x 25 mm x 33 mm, 111g. Unknown maker, English, c1870. Glass bottle with ground glass stopper full of Rouse's Chlorodyne (morphine and chloroform tincture). 109 mm x 32 mm x 26 mm, 123g. Prepared by Rouse & Co., Wigmore Street, London, c. 1860. Glass phial with glass stopper of Chlorodyne (mophine tincture and chloroform) within a plastic tube. 91 mm x 19 mm diameter, 30 g overall. Burroughs Wellcome and Co., London, early 20th century. 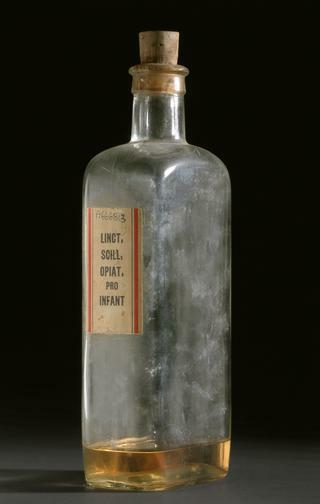 Rectangular glass bottle with glass stopper and kid covering of Chlorodyne (Tincture of Chloroform and Morphine), half-full. 123 mm x 35 mm x 35 mm, 141 g. Produced by Savory & Moore, London, 1870-1901. Rectangular glass bottle with ground glass stopper of Chlorodyne (Tincture of Morphine and Chloroform), half-full. 89 mm x 29 mm x 18 mm, 60 g. Produced by the Army and Navy Co-Operative Society and dispensed by J.E. Lidwell Chemists, London, 1871-1910. Glass bottle with glass stopper containing a small quantity of Chlorodyne (morphine and chloroform). 60 mm x 35 mm x 22 mm, 52g. Dispensed by J.F. Hewitt, English, 1850-1900. Large glass drug jar with glass lid for Liquorice and Chlorodyne (morphine and chloroform) pastilles, with traces remaining. 160 mm x 115 mm diameter. Unknown maker, English, late nineteenth century. Rounded glass bottle with glass stopper and pink-chamois covering containing Dr. J. Collis Browne's patented Chlorodyne (morphine, chloroform and cannabis). Label reads, 'Dr. J. Collis Browne's/ CHLORODYNE/ An Invaluable Remedy in Consumption, Asthma, Bronchitis/ Croup, Fever, Neuralgia, Diarrhoea, Dysentery, Cholera, &c.' Dispensed by J.T. Davenport, English, 1850-1890. Glass bottle in leather case, containing Tabloid brand Chlorodyne (morphine and chloroform). 115 mm x 45 mm x 45 mm, 200g. A fabric bandage overs the stopper of the bottle, probably applied early in the bottle's history to stop leakage. By Burroughs Wellcome and Co., London, 1919-1933. Leather-covered gutta percha bottle, containing chloroform and morphine compound tincture (chlorodyne). 118 mm x 39 mm x 39 mm, 164 g. Prepared by Burroughs, Wellcome and Co., London, 1906-1920. Glass bottle with glass stopper and chamois covering full of Collis-Browne's Chlorodyne. 87 mm x 30 mm x 17 mm, 71g. Dispensed by Williams and Elvey Chemists, London, nineteenth century. 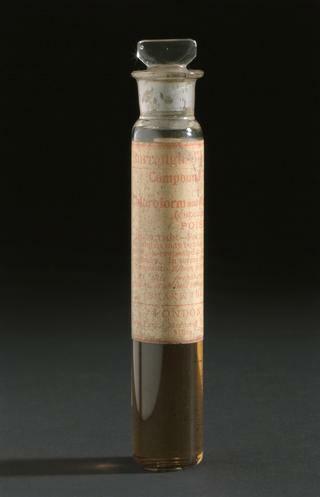 Square iron canister of Tincture of Chloroform and Morphine (B.P. 1885), with contents remaining. 157 mm x 60 mm, 240g. Unknown maker, probably Maw or Arnolds, American, 1915-1916. Paper envelope containing gelatin lamels impregnated with chlorodyne (morphine and chloroform compound tincture). 103 mm x 64 mm, 3 g. By Savory and Moore, London, c. 1915. Cylindrical bakelite tube for Compound Tincture of Chloroform and Morphine (chlorodyne) with traces remaining. 90 mm x 19 mm, 19g. 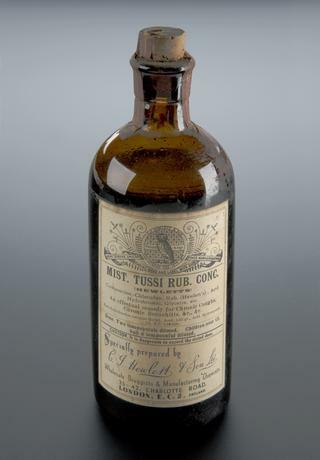 Printed label reads, 'Burroughs Wellcome & Co./ SHAKE THE BOTTLE/ COMPOUND TINCTURE/ of/ CHLOROFORM and MORPHINE/ (chlorodyne)/ POISON/Direction.- For an adult, from five to/ ten minims may be taken in a wineglassful of/water...' By Burroughs Wellcome, English, 1907.